The Preface for Sunday last, the feast of Ss Peter and Paul, nicely describes the distinct and complementary ministries of the two Martyrs of Rome, Apostles to the whole Church. Rather nicely, in the image above of a glass disk from the collection of the Vatican museum the two saints do indeed share a single crown! So often in life we notice and then focus on what distinguishes us from one another. Too often we neglect what we have in common. Jesus, by contrast, seems to have specialised in finding common ground with those who others have excluded and set apart. In a time of prayer and reflection consider where you might do the same. Image from the Vatican Museum. The Gospels regularly present us with the fallibility of Peter. The gospel chosen for the Feast of Ss Peter and Paul, kept yesterday in England and Wales, presents Peter in a better light. Peter confesses Jesus as the Christ and the Son of God. Quick as a flash Jesus makes a profession of faith and purpose regarding Peter. Which of them was the most surprised at what they heard? Both find in this exchange a description of their mission to the world – Jesus sent by the Father to be saviour of the world. Peter the one entrusted with ensuring that the message of salvation is made known to the world. Master and servant are united in common purpose. Pray for Pope Francis, successor of St Peter, for his faithfulness in continuing the ministry entrusted to him. 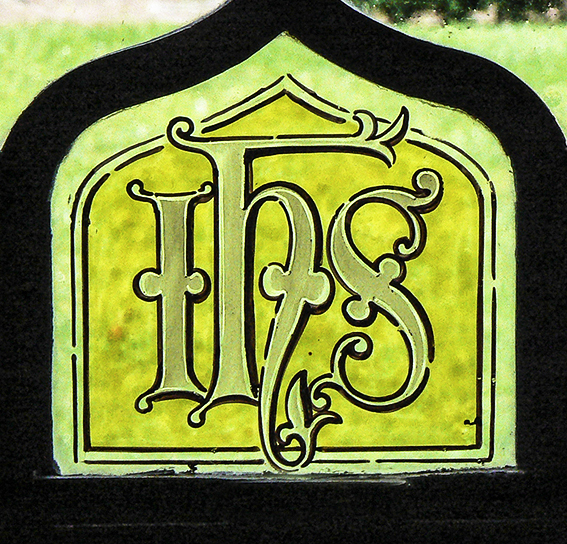 Pray for the whole Church for its steadfastness and humility in its service of teh world. Jesus saving Peter from sinking. St Peter’s Church, Wolverhampton. Speak Lord: Son of God. The Gospel reading of the Mass during the Day for the feast of Ss Peter and Paul (kept on Sunday this year, in England and Wales) comes from Gospel of Matthew. It draws us into the profession of faith of the Apostles that forms the bedrock of Tradition. 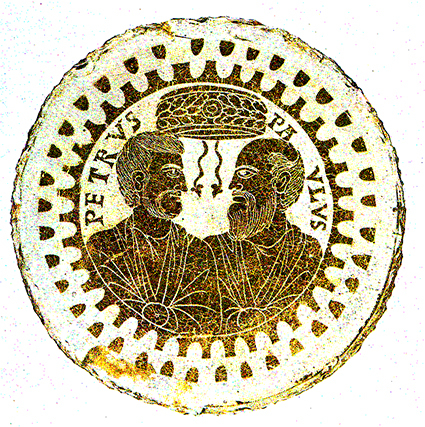 Peter and Paul lived and died for the Christ confessed as Son of God and known as Saviour. They received the gift of life and love from him, and faithfully passed on to us the invitation to that same intimacy. Why does the relationship of faith matter to you? What would be the main aspects of faith that you would like to be known by others who do not have faith? 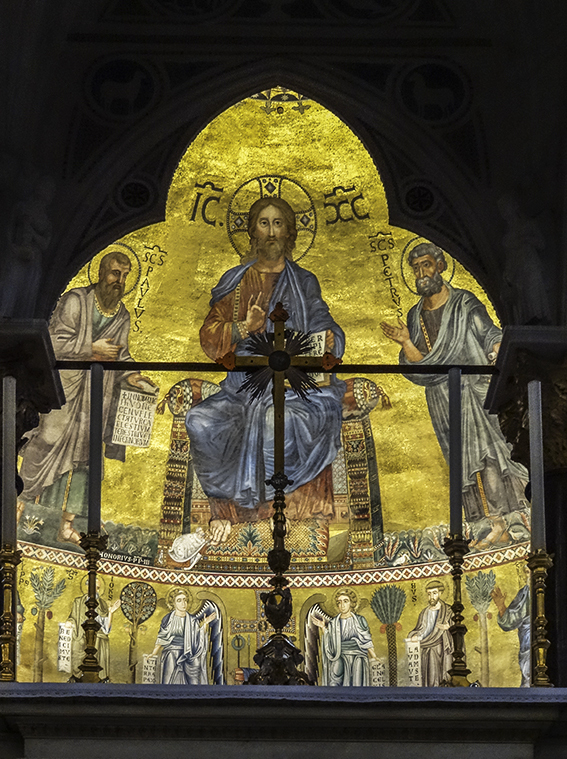 View of apse mosaic at St Paul outside the Walls. (c) 2014, Allen Morris. Speak Lord: that your gifts might be fruitful in us. The second reading on Sunday, the feast of Ss Peter and Paul (in England and Wales), speaks of Paul’s empowerment by the Lord’s grace, and Paul’s offering the free gift of his life to the Lord. That there might be such reciprocity between God and his creatures – he gives in love, we make return grateful. Reciprocity and a co-operation in mission – the Lord reaches out to us, and renewed we are helped to reach out to others. What gifts are you aware of receiving from the Lord? How do you make use of them, and for whose benefit? Icon of St Paul, at Basilica of St Paul outside the walls. (c) 2014, Allen Morris. From all my terrors the Lord set me free. or The angel of the Lord rescues those who revere him. Again and again Christian tradition testifies to how martyrs display joy at the opportunity of joining with Christ in his suffering. Their confidence that death is not the end is powerful witness to the Church’s faith in the resurrection and the gift of eternal life to believers. What challenges you in times of trial? What sustains you in times of trial? 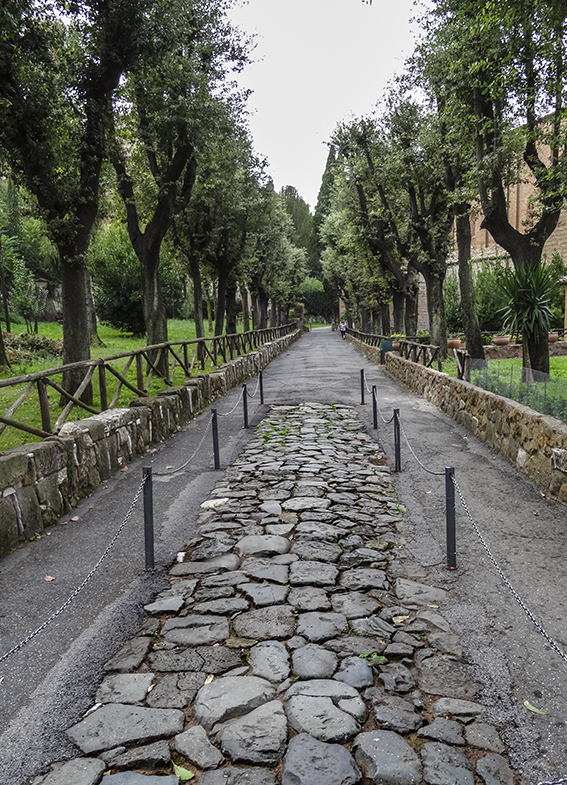 Roman Road at Tre Fontane, traditional place of the execution of St Paul, Rome. (c) 2014, Allen Morris. The first reading at the Mass during the day on Sunday, the feast of Ss Peter and Paul, comes from the Church’s Easter book, Acts of the Apostles. Like the season, this reading proclaims the gift of freedom. 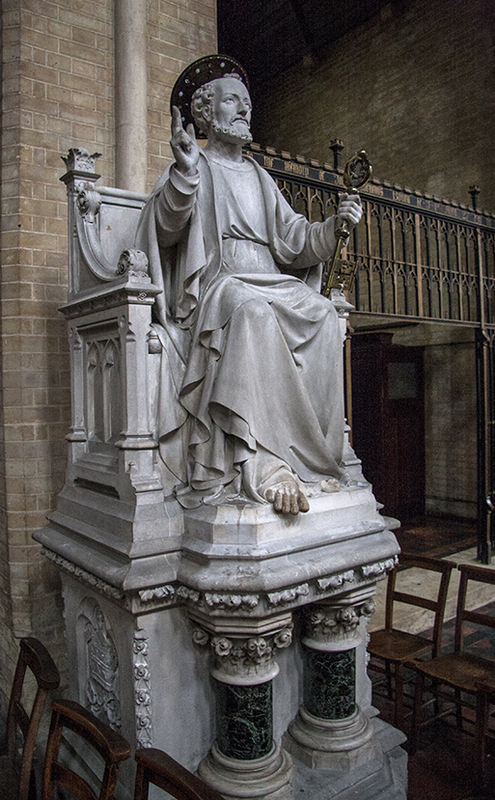 In our devotion we often venerate images of St Peter which are hieratic or imperious. Such as the obviously much love figure photographed at the head of this blog. Yet the Peter of the Gospels and the Peter of Acts is so different to that. Weak, fallible – in himself, vulnerable. In the scriptures, mostly we see Peter struggling towards a complete reliance on God, from whom his strength and safety come. There are many times in his story when he realises ‘it is true’ but then fails to live to that recognition. St Peter, pray for us. And us, let us pray with St Peter and learn from his example, so generously shared with us. ‘Who can this be?’, ask the disciples in the Gospel we heard on Sunday, ‘Even the wind and sea obey him? At Mass the baptised pray in and with this ‘him’, Jesus, Son of God. And we pray with him to the Father in the Spirit. those you set firm on the foundation of your love. And all this happens because God is love and saved by that love we are called to a fresh and deeper communion with God. Jesus, Son of the Living God, have mercy on us, sinners.